Two weeks ago I added a new page to my menu. I named it Art Gallery. Each week I will publish one or two pieces of my art. As time goes by, the Art Gallery will grow and unlike my posts will become a prominent and stationary place for everyone to view my paintings. 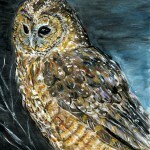 Today I will add a wolf and an owl painting to the gallery. Ich habe mir beide Bilder sofort (wie Wolf 1)auf mein Iphone geladen-sie gefallen mir sehr-ich werde sie meiner Tochter Maria zeigen,die auch malt und sehr grosses Interesse an deiner Galerie gezeigt hat!Freue mich schon auf die nächsten Bilder!